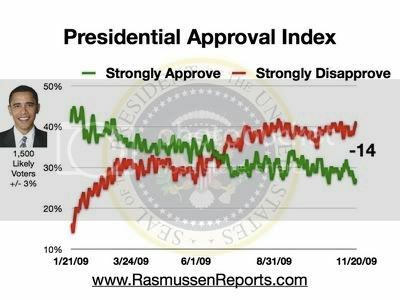 President Obama's approval rating in the Rasmussen Presidential Approval Index is now at -14, the third straight day it has been at that number. That is equal to the lowest rating recorded during the Obama Presidency. The "Presidential Approval Index" is figured based on those who "strongly approve" of the job Obama is doing, minus those who "strongly disapprove" of his performance. Today, that stands at 27%-41%. Obama's overall approval rating is at 47%-52%. The Rasmussen Reports daily Presidential Tracking Poll for Wednesday shows that 27% of the nation's voters Strongly Approve of the way that Barack Obama is performing his role as President.Oh thanks God atleast statistics speak in favour of Obama.